Screen shot of CDOT's traffic simulation of the recommended design for the traffic circle. Green lines represent bike routes and white lines represent pedestrian routes. 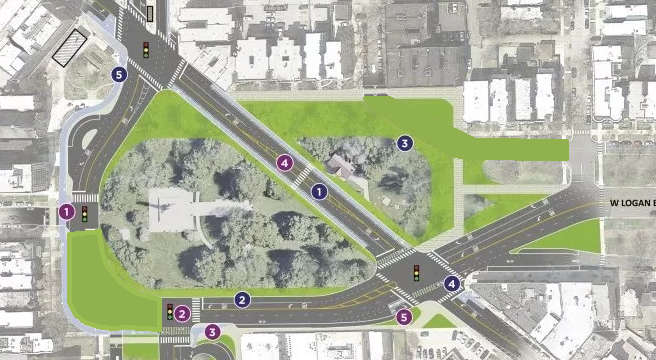 For many years Logan Square residents have been pushing for the city of Chicago to fix the traffic circle in the center of the neighborhood that’s a safety hazard for all road users and a barrier to walking and biking across the neighborhood. Now that dream is close to fruition. At a community meeting last night at Logandale Middle School, Chicago Department of Transportation staffers presented the agency’s final recommendations for redesigning the circle at Logan Boulevard, Kedzie Avenue, and Milwaukee Avenue, as well as the Milwaukee corridor between Logan and Belmont Avenue. While the department presented four different design concepts that had been considered, officials are recommending a bold reconfiguration of the historic square that would also return the space to its roots as a safe, people-friendly gathering spot. The second scenario, called “Traffic Oval,” would realign Kedzie by the Logan Square Blue Line station to create a new plaza, and pedestrianize the segment of Milwaukee that divides the two portions of the green space within the traffic circle, which contains the eagle-topped Illinois Centennial Monument pillar. However, as with Spot Improvements, one-way, counter-clockwise traffic around the circle would be maintained. The third option, “Two Way, Trip Match,” would convert the streets on the west and south sides of the circle to two-way traffic to provide more direct routes for the most common traffic movement. Milwaukee and Kedzie would keep their current locations, but the most of the roadway on the north and east side of the circle would be converted to park space. Based on feedback from attendees a previous community meetings, as well as the local aldermen, community groups, and other stakeholders, CDOT ultimately settled on concept four, “Two Way, The Bend” as the best option. This “bends” traffic on Milwaukee to the north and east sides of the circle, unifying the existing green space, and also includes the Kedzie reroute and plaza. Traffic on the south and west sides of the plaza would become two-way. While Traffic Oval and Two Way, The Bends have things in common, CDOT’s detailed analysis determined the fourth scenario would do a better job of improving pedestrian access; would allow flexible use of public streets, including closures for festivals and other special events; and would have the greatest impact on traffic safety. While concept two would only include two crosswalks, for example, concept four would feature eight pedestrian crossings. CDOT also argued at the meeting, using a traffic simulation video, that the Two Way, The Bend layout would be less confusing for drivers. As for the rest of the Milwaukee corridor, CDOT is recommending the less bold of two options. The department initially floated the idea of building fully separated bike lanes on this high-bike-traffic street. But since this would have required eliminating 46 percent of the on-street parking spaces, it would have been politically difficult. Instead, CDOT is planning to stripe dashed bike lanes on the relatively narrow roadway, similar to the current layout of Milwaukee in Wicker Park. On the plus side, the corridor will get new sidewalk bump-outs to shorten pedestrian crossing distance and provide space for sidewalk cafe seating. CDOT’s lead engineer for the project, Nate Roseberry, indicated that, barring a major uprising against the project, the department should be moving forward with construction of concept four in the near future. Such an insurrection seems unlikely at this point. At the meeting, which was attended by some 150 people, I heard a few grumbles from residents who felt that the free-flowing traffic shown in CDOT’s traffic simulation was unrealistic. But most people I spoke with supported the designs CDOT chose, citing the improvements to safety and access, and the creation of new public space and the ability to use the streets more flexibly. One resident said she was particularly excited about the possibility of relocating the Logan Square farmers market onto the pedestrianized section of Milwaukee. Representatives from Chicago United for Equity spoke with attendees as they entered the space, requesting that they fill out a questionnaire asking for their opinions about the potential burdens and benefits for of the project. Along with the Logan Square Neighborhood Association, the group held meetings earlier this year as part of a Racial Equity Impact Assessment of the project. Their goal is to prevent longtime residents from being displaced by increased housing costs in the wake of this neighborhood improvement, which will make the area a more desirable place to live and raise property values. A rep from CUE told me they want to see the city be proactive about preserving affordability with strategies such as turning the Emmett Street parking lot, next to the main Blue Line entrance, into an all-affordable housing development. She said they’d like to see CDOT voice support for preserving affordability, in order to help get other relevant city agencies on board with the idea. When I asked Roseberry about the possibility of CDOT endorsing the idea of creating an affordability strategy for the circle project, he simply referred me to the Department of Planning and Development to get a comment, implying that CDOT was solely concerned with the transportation aspects of the project. But as we’ve seen from CDOT projects like the Bloomingdale Trail, which has been associated with a major spike in housing prices along its corridor in Logan Square and Humboldt Park, transportation projects can’t just be viewed in silos — their impact on affordability must also be considered. Did you appreciate this post? Consider making a donation through our PublicGood site. Nice that they are moving forward with this. Which will be done first, this or the flyover? I wish Milwaukee between Logan and Chicago could have a similar “transit mall” idea to King Street in Toronto, with non-continuous segments for drivers. If you need the parking there, then keep it and sacrifice the through-traffic. Commuters have the option of the Kennedy, which sees significantly less foot traffic. Both will probably be done before the “Stone Bridge” over the North Shore Channel between Lincoln and Devon. Did anyone from CUE elaborate (or would you care to elaborate John?) on how CDOT could incorporate affordability into their projects, beyond supporting corresponding affordable housing proposals? I think making this area more pedestrian and public transit friendly actually lends weight to the argument that the Emmet St lot would be better served as affordable housing with some kind of community shared use component. Because we don’t need the parking to support the local businesses if more people feel safer walking and cycling. New residents in a true-to-the-spirit TOD would in fact be exactly who you’d want right in the heart of the Square, as they will be residents patronizing local stores, sending kids to the schools, using CTA, etc. The argument this will inflate property values any more than they will increase otherwise seems questionable. Following that logic we should just get rid of the Logan L stop altogether, as of course access to public transit carries value in the housing market. This is not really like the Bloomingdale Trail and 606 system, which extended a realtors-dream amenity sold as a cross of Chicago’s High Line and a series of pocket parks deep into the west side that was largely off of the gentrification radar, but actually did/do still need safer ways for people to bike and walk. The biggest failure there was falling for the 606 marketing hype that came with adding all of those little parks, that is the fuel that caused the real estate value fire. Christmas of what year? 2025? Clark from Fullerton to Lincoln Park W.
I went to grade school in Lincoln Sq. though, so I might have a skewed view of how wonderful this kind of street redesign is for a neighborhood. I always love talking to people who think the one-way section of Lincoln Ave is what ruined traffic, as I used to go through that area all the time before that happened, and can state with 100% first-hand certainty traffic was just as horrible before hand. I guess turning California into a plaza sinks my hope that the CTA would capitalize on the Logan Sq stop real estate and build a CTA owned (& privately managed) TOD rental. The gentrification of the 606, the area west of Western, was a fait accompli before the 606 was built. The real estate downturn of 2008 slowed the process down (in real estate, recessions affects marginal areas more adversely than established areas) and the build of the 606 sped it up again. But the 606 didn’t cause it. I think that is an overstatement. I agree in a general sense along the 606’s eastern edge, but further west, the blocks to the east and surrounding Humboldt Park were gentrifying (it’s not really any secret that Humboldt Park itself has *long* been on the radar), but the 606 can be directly connected to the explosion of development west of at least Kimball. Go check out Wabansia at about 3900 west, and realize that you are standing across the street from Simon Park, which is the park that gave birth to the Simon City Royals. To say that area was nowhere near being hot would be an understatement. It’s still run down and largely features blocks of older, unimproved housing. Remove the 606 as a catalyst and fuhgeddaboudit, it would take decades for that area to gentrify, if ever. Yes, I’d love to see the CTA sell the land at the Belmont and Logan Square stops to a developer, who could build massive mixed-use properties with varied housing types. The stations would of course be maintained in one of the storefronts, kind of like what you see in London. That’d be great. I’d love to see a big, 250-unit, 0-parking apartment building go into that spot on Emmett Street. They could have a mix of housing types. Affordable, market-rate, military-friendly, senior, et cetera. I don’t want to see them sell them, but rather have them produce income like they do for HK’s metro, albeit at a much smaller scale. Obviously the poorly designed intersection in the southeastern corner needs to be fixed by curving Logan BLVD as well. There is no excuse for not have right angles here. Lincoln is a tougher sell. Clark has LSD and Ridge as a parallel the entire way, and the same principle could be applied to Archer in the south with I-55. We don’t need cut-through diagonals that are parallel to other arterials, they’re redundant in our grid system. NY started along a similar path with the Broadway plazas and found it to be great for businesses. The section of Lincoln that I called out would be more of a short partial closure in a similar way to how it was done in Lincoln Square. It’s not really that the diagonal is being closed, but more that anyone using it as a through street hops onto Ashland for a short bit to eliminate a 6 way intersection. Which would make the intersection more efficient while opening up sections of Lincoln as either a shopping focused one way street, or as a pedestrian street around which cafe’s & bars would be located. We can’t do this at most 6 way intersections because the intersecting streets don’t often have the existing lights & widths to handle the change. But the Roscoe/School couplet already provides this flexibility, as well as Greenview & Barry both have lights when they intersect Belmont & Ashland respectively. There are a lot of ways that the traffic flow around the Belmont/Ashland/Lincoln intersection could be reimagined so that traffic moves with a better balance of efficiency & safety. I agree with the option presented and appreciate the time the designers took to explain the design. There are, however, some design issues that need to be addressed including expansion of the Kedzie Plaza, better pedestrian protection, and ride share space. First, the design shall make clear where there is dedicated space for ride share drop off. This project must address the disruption currently caused by ride share drop offs and pick ups to bicycle and automobile flow. Second, the bus drop off designed in the proposed Kedzie plaza creates two conflict points between buses and pedestrians. It additionally breaks up the plaza, disrupting the open, safe travel of pedestrians from the east to the blue line station, and reduces the square footage of space that could be devoted to pedestrians (seating, adult play like bocce or swings, etc. ), exterior retail/cafe revenue generation, trees, or storm water attenuation. I recommend placing an enhanced (heat, bus times, etc.) bus shelter for west bound Diversey buses with raised ADA bus entrances on the northwest side of realigned Kedzie Ave in lieu of disrupting a great future plaza. Drop off of goods to the plaza could be accomplished with pneumatic bollards retractable via a passcode for local businesses. This is commonplace in French cities where road traffic is minimized to only local residents by bollard placement. Lastly, the City must acknowledge that as currently designed, cars are not compelled to stop for pedestrians in crosswalks. A speed limit of 30 mph further exacerbates danger to pedestrians attempting to cross Milwaukee Ave. The City and State should consider reducing the speed to 20 mph where crosswalks are planned. This project is an opportunity to design a new type of crosswalk designed to compel drivers to stop for pedestrians. This new type of crosswalk could include traffic calming measures such as a traffic table, speed bumps, in ground flashing lights, or zig zag striping to reduce perceived road width. It is time for drivers to start obeying state traffic laws. Will Chicago create infrastructure that makes pedestrian safety laws viable or continue to put pedestrians in peril by not enforcing state law and insufficiently designing pedestrian infrastructure. Neighbors want to help ensure that the improvements don't accelerate the displacement of longtime residents. Active Trans worked with the Logan Square Neighborhood Association and Port Urbanism to come up with ideas to improve walking and biking on the hazardous stretch of the boulevard near Western. The group opposing the project says they want an RFP process and changes to the design. The local alderman says they're actually opposed to the 100 units of affordable housing.